I am the queen of substitutes in the kitchen. It's because I do most of my cooking on the fly. 90% of my dinners are unplanned until about 5 minutes before I make them. So I am constantly substituting in ingredients for other ones and I thought I would put a little list together for you today. Rice. If you are out of rice use Quinoa or noodles. I LOVE Quinoa. Is has protein, it's gluten free and a whole grain (well, technically a seed). I make most of my rice style dishes out of it like, Jambalaya and pilafs. But you might not have that either. So then I might use noodles. I have even been know to break up spaghetti to go in soup when I was out of everything else. Bullion cubes. If course you can use stock or broth to sub in, but if you are out of bullion cubes you may just be out of stock. So check your fridge for soy sauce. Don't use too much, as it's is salty. But add in a tsp. at a time and try to build up the flavor. If it still lacks but the soy sauce taste is getting to strong add in a tiny bit of lemon. I use the soy sauce and lemon trick all the time to deepen flavors if foods seem lacking. Whatever Veggie Your Recipe is calling for. Don't be scared to use a different veggie in a recipe. I think green beans pair with many dishes that call for broccoli and vise versa. Whatever Meat Your Recipe is calling for. Most recipes can easily interchange beef, pork and chicken. Sure, it is going to taste different but it will probably taste fine. Beans. Not all beans sub in well for others, but many do. Many casserole recipes are fine with either re-fried or whole beans. If you want a side of beans for Mexican food, re-fried, whole pinto and whole black beans are perfectly acceptable. And I have found most any whole bean works in chili and soups. No need to lament if you need kidney beans and all you have are black beans. Fresh Garlic and Onion- Dried are just fine, always have them on hand. Add about a 1/2 tsp at a time and taste as you go. For me, what it really boils down to is not stressing in the kitchen, especially when cooking (it is harder to substitute when you are baking). Dinner does not need to be a major affair nightly. There are not rules you need to follow. You just want to get a healthy meal on the table for your family. So relax (be a little lazy) and let it go. 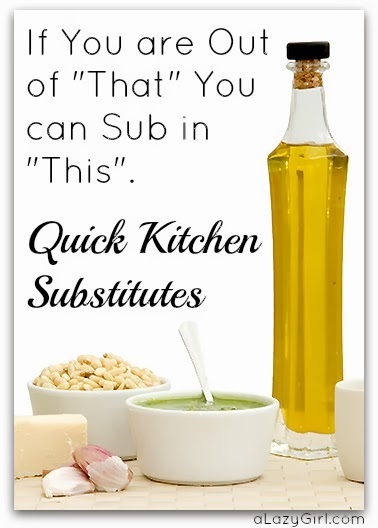 If you have any substitutions in the kitchen questions, leave them in the comment. I would be glad to think about it and get you a solution. Also, make sure to share your best substitutions. If the soy sauce gets too strong, a little instant coffee or leftover morning coffee works great too here in the south it is used often in red eye gravy. LOL! I never comment but the "Red eye gravy" got my attention. I am from Illinois but my moms family is from Georgia. So I know what Red eye gravy is. But you would be surprised how many northerners do not know what Red eye gravy is. I make it at most holiday dinners. People think I an nuts when I tell them how it is made. I love it!! But not too many people know I use a little coffee (stronger the better) in my brown gravy, beef stew and lots of other things, and they never know. As long as you don't go overboard with it, it is a great flavor enhancer. I have seen people add that "Kitchen Bouquet" to enhance the flavor of their food and little do they know left over coffee (I don't use instant) does just as well and is much less expensive. Quinoa is not a whole grain. It is a seed. She says that in the article!